Interesting little tidbit: In the early 1800s, ivory was the primary material used in making Billiard Balls. However; as it typically does, supply and demand dictated that something else needed to be engineered to function just as well and make quality billiard balls. Nowadays, billiard balls go through a long production process. An organic peroxide catalyzes calcium carbonate and unsaturated polyester resin. Then, all of the air is removed through a process much like vacuuming that brings the ball together. After that, it is cooled. This causes shrinkage of the major portion and fills the connection in completely. The idea is that every ball is a perfect sphere that has a uniform weight with no air inside. This process makes it almost impossible to have a bad ball. All of that being said, there are currently hundreds of billiard balls available for purchase. How on Earth are you going to decide which set is the best for your needs? Some things to consider are what your skill level and play time allow. If you’re going to play in your basement once a month or so, you will be fine with a lower end ball. If you play more than once a week or are looking to be a more competitive player you would definitely want to pay a little more and get a more solid ball that will last longer, protect your pool table investment, and offer a more consistent play. The consistency of the materials used to make the billiard balls is what will influence your quality of play. If your ball is inconsistent you may see erratic ball behavior, your ball may zigzag, or you may get some inconsistent banking. Most people will be quick to blame this on the surface of your pool table, but that may not always be the case. 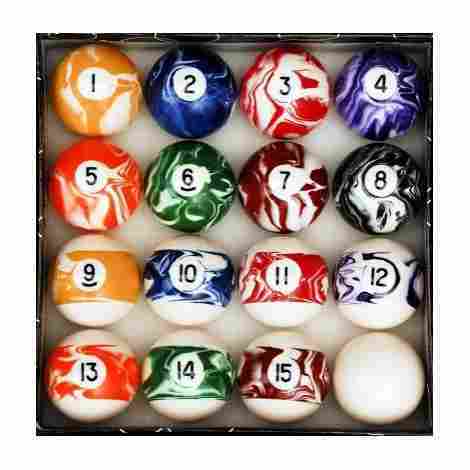 Let us help you decide which set of billiard balls will best suit you and your wallet. These balls are standard size of 2 ¼”. Each poly resin ball is polished and calibrated for perfection. 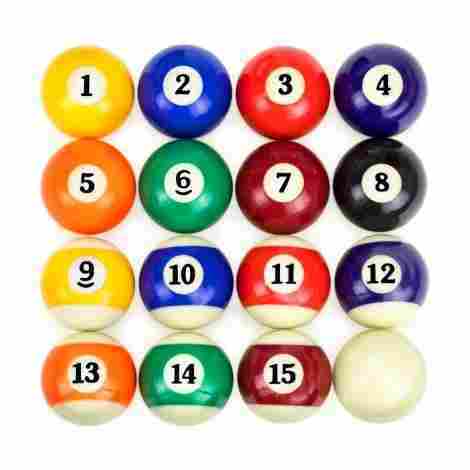 The cue ball is included in this set which gives you a total of 16 balls. If you’re just getting started or teaching your kids to play, these balls will be the perfect starter kit for you. They are inexpensive, roll nicely, and will handle a good basement game of pool all day long. The price is right, the balls are polished nicely, and they deliver quickly! Polyester resin rarely loses its shape and is incredibly resistant to overheating. Each ball has been calibrated and polished to a lustrous shine. The high-grade poly resin will maintain its shape and shine through a lot of regular usage. They can heat up on the table and be able to withstand the heat without losing their shape. 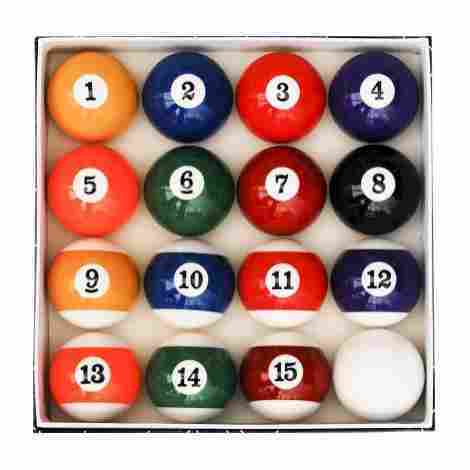 This set or standard size billiard balls is great for beginners and/or children just learning to play. The balls are uniform and roll well, it comes with a cue ball and case. If you are an experienced player who plays several times per week, you’d probably want something a little more. But when you’re just getting started and playing a couple of times per month, this set is just what you need without breaking the bank. This billiard set is remarkably well priced. It is a good quality ball with a long life and will give you years of fun and consistent play. You get everything you need to get started, it is a high poly resin design and calibrated to perfection. You will not be disappointed with this purchase. This training ball allows you to see the spin of the cue ball and is used for training your shots to get the break you want. Regular use and practice with this type of ball give you a great indication of roll and can greatly improve your percentage of long shots. It is also fun to see the spin you put on the ball, whether it is intentional or not - which makes it a very effective learning tool. This is a training and practice cue ball. It functions well to train because you can see how the cue ball is moving. It is particularly helpful with longer shots. You will be able to tell and understand what your ball will do when hit in certain spots, the angle it will take, and the effect of the spin on the object ball. You always want to use proper grammar - and perfect your english while playing pool. This ball allows you to set the ball just a little off center so you can strike it on either side of its vertical axis, giving it that famous “english” side spin. This also occurs when the ball collides with another or with a rail. Being able to see the action vs. reaction will allow you to become a better player with every strike. This ball will be a great addition to your table. Being able to work on your shots and see which way the cue ball is spinning will be invaluable for your overall game. 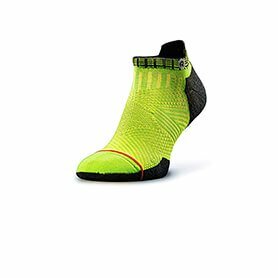 It is reasonably priced and holds up well through much training and practice. It is well made, holds up well through regular training and practice shots. You would do well to own at least a few of these. These are a nice, standard sized ball. The cue is a nice bright white and the play balls are vibrant. They are very consistent in weight and size and they play well. These are delivered in a very nice box which would also make an impressive gift. The low price makes them an excellent and affordable option which will really compliment your own pool table. The ball quality is consistent. There is little or no chipping or signs of usage after long periods of play. This set will give you years of casual play with no real sign of wear on the balls besides a slight blue that may be left by cue ball chalk. This set of balls is clean, complete, and inexpensive. This set of balls will arrive promptly and in great shape. They are inexpensive and convenient for all types of budgets but come packaged very tightly in a nice box. They feel and play as well,if not better than any bar table set. They come highly polished and looking great. It is a very nice looking set and would also be a great gift to your pool enthusiast. These balls will go a long way. They last a long time and really don’t cost any more than other sets, especially those of similar quality. You will get a lot of use out of these without a ton of money up front. This Grade A deluxe quality ball set is regulation weight and size, and is polished in a beautiful marble/swirl style that everyone is sure to love. 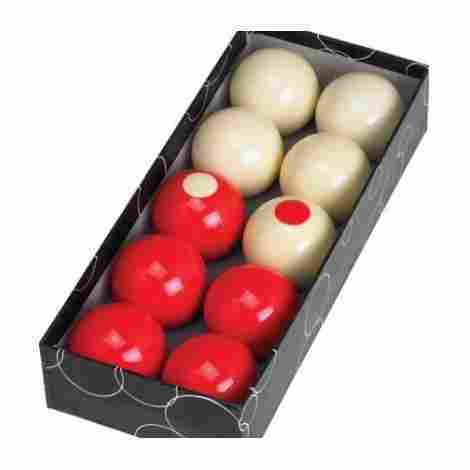 It is made with polyester resin and comes as a full set including the cue ball, and comes in a nice solid box. They roll smoothly on the table and all the hits are consistent. These marble/swirl balls are absolutely stunning with beautiful marbilization on each ball. Each ball is unique and has an individual style. These are absolutely beautiful billiard balls that will really make your pool table pop! They are regulation weight and have a studding appearance. No matter where you play with these balls, they will stand out in a crowd. People will notice and comment on them. They feel solid and play just as well as any other set you’ve likely used. They are great for a home table or pool hall and have a really cool design. These balls are made of poly resin. What that means for you is that they are weight calibrated and you should have minimal deviations while playing. The surface is polished and the balls move without leaving marks in their path. In a not-so-common-occurrence, these balls are actually better in real life than in the pictures used to advertise them. The intricate swirls and glossy finish combined with painted markings combine to make a ball that you will not be able to find anywhere else. You will always get mountains of compliments from your friends. They will make an excellent gift and any pool connoisseur will be thrilled to receive them. This beautiful ball set will be worth every penny you pay for them. This set comes with a cue ball, 7 stripes, and 8 solids that are all regulation size balls, measuring 2 1/4 inches longs. They are made of high quality phenolic resin that gives them great impact and scratch resistance. A neat feature of this set is that it has Vitrotech Technology. Your play is improved with this technology by heat-curing the balls and ensuring excellent impact resistance. Weight and hardness is very consistent here and the colors are superb. These balls resist friction well and work great for any skill level. Made with the highest quality phenolic resin, these balls are heat-cures using the specialized Virotech technology. The result is lengthened durability and will last for years to come. These balls are beautifully round and resist friction well which means you won't have any burn marks on your pool table. The Aramith name is renowned in the pool industry. Almost every ball in this review is, at some point, compared to an Aramith ball. They are made in Belgium of pure phenolic resin - some of the only ones available. This means that they bounce and roll nearly exactly the same every time you hit them. They also have a longevity that is beyond rivalry. If you are looking for the best pool ball, you will happily pay the price of an Aramith. These have to be replaced so much less than other balls that in the long run, you’re likely going to spend more money replacing the less expensive balls anyway. Factoring in their playability and longevity, they are well worth the price you pay. 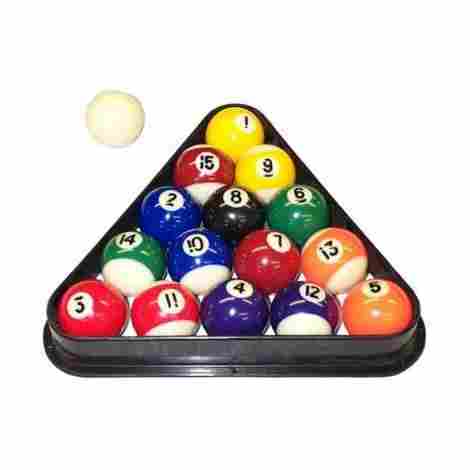 This is a nice, complete set of 16 balls with a triangle rack included. You will get your 8 solids, 7 stripes, and one cue ball. They are made of high quality resin and are smooth and shiny. It is important to note before purchasing that these balls are made for a smaller table that you are more likely to find in a home and only have a 1 1/2 inch diameter instead of 2 1/4. 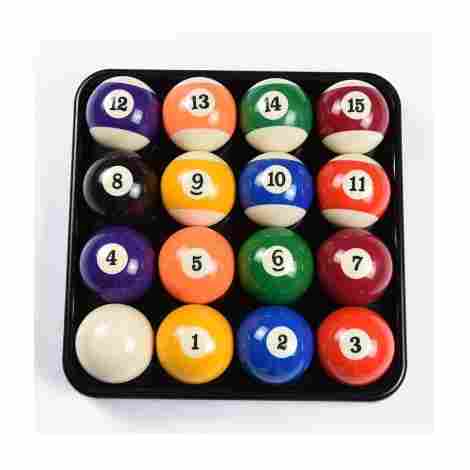 Since this ball set is smaller than standard size, it is perfect for kids’ tables that have multiple games like pool, foosball, hockey, and ping pong. It can be hard to find balls for children to learn with on a smaller surface, so these can definitely be a win! They are very much fun, adorable, and cute little balls that play very much like the full size. They come packaged in a very nice box. If you need mini balls, I highly recommend these. Even the mini balls are made with high-quality resin which makes them perfectly round, scratch resistant, durable, and shiny. They will be a great match for teaching youngsters to love the game and get them excited to play with a smaller version of a professional billiard ball. They will have the look and feel of a standard size ball and will have a similar roll and bounce with each strike. A great teaching tool! This set is quite inexpensive and will prove durable enough to survive a younger child’s play. They are just the right size for our old game table. This will allow the next generation of kids to enjoy mini pool and get them started in the love for the game. It comes with a triangle rack and is the perfect addition to any mini billiard collection. This is one #8 ball of regulation size. This is just the replacement ball, not a full set. It is made of high quality polyresin, is standard regulation size, and has a nice shine with a smooth roll so can be used to replace any #8 ball of any set and blend in nicely. And of course if you want to switch it out for a nice gear shift in your car, there are all sorts of directions and selections for that as well. This ball is also perfectly round and can serve as a trackball for a fancy button computer mouse. It is inexpensive to buy, it is just one ball, and high quality so will last for a very long time. Let’s praise the workmanship on this ball first. It is made of high-quality polyresin, has a nice shine, and smooth finish. They come well marked with no smears or smudges, do not chip easily, and are perfect for a replacement of one in your set. Odds are, if you’re an avid pool player you’ll likely need to replace your entire set at the same time, but if you own a pool hall or bar, this would be the most common ball to go missing. It does live up to its name as a replacement #8 ball. I remember the first time I rode in my brother’s ‘50 Ford pickup truck. I thought I was the coolest kid out there. His truck was always so clean and decked to the nines. 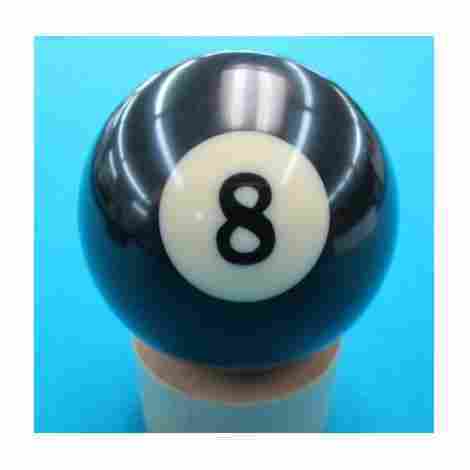 He had this awesome #8 ball on his gear shift and he was definitely my hero! In reading through the reviews of this ball, I am finding that this is a quite common use of a #8 ball. So far as to list step by step instructions on how to make it fit on your gear shift! What I did not know (apparently I am not much of a computer tech), is that you can also customize your mouse with this #8 ball and it works great with most CST & other type trackballs. So as long as you know what you’re looking for, this ball could be the beginning of your own customized dreams! This is one ball, sold alone, and is quite inexpensive. No matter what you choose to use it for you’ll be able to afford it. 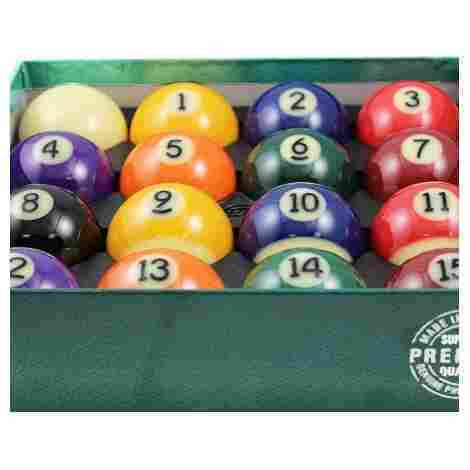 If you want it for your pool ball collection, it is made of fine quality products and will fit in nicely. If you’re looking for a gear shift or trackball, you still will not be disappointed. Even if it breaks during the drilling transformation, it is inexpensive enough to be able to do a few practice runs before perfecting the final product. Go for it! Felson is also a well known name to most pool enthusiasts. Everything you need is included in this ball set. You’ll get the 7 striped, 7 solid, a black #8 ball, and a cue ball. They are of regulation size and tournament ready so you can take your own set to any tournament, pool hall, or your own basement. They are great for practice and professional play. Of course, for the price of this set, you should not expect top dollar, professional balls. This is a really great amateur set with a little more bounce than a professional set. They are made of high-quality material, smooth, and round, however a little heavier than a typical tournament style ball. If you plan on using them once in a while they will be great. If you’re practicing or playing a lot you will likely need to replace them fairly soon. If you want something to play around with in your basement for some fun, this would be a great purchase for you! Each ball is precision engineered to regulation size and is crafted from high quality blended polyresin. They are individually calibrated for roundness and weight and are also glossed to a beautiful shine and vibrant color. These balls are a beautiful addition to any pool room. They also come individually wrapped in bubble wrap inside a solid box, for less chance of damage during shipping. The cost of this entire set of billiard balls is very reasonable. They are high quality and will withstand much play from a novice, or infrequent player. They are easy to order, come professionally packaged, and quickly. They are a good price for a good product and I would recommend them to anyone looking to get started in the game! Do you love football? If so, these are the pool balls you want to own! They come with your favorite team's logo digitally printed on them. Instead of the classic stripes and solids play that you are used to, your team's home colors fill one roll and their away colors the other. They are made of the best polyester resin and are meant to resist any cracking or chipping. The cue ball has the NFL logo to further your football-pool experience. The unique take on the #8 ball is sure to be a hit among your friends and family and will be the most fun you’ll have, besides watching your team in action. This collection is perfect as a gift. They are made of high-quality material, solid and round, roll smoothly and have a good feel. Besides all of that, they come packaged individually wrapped and protected in a solid box. They are vibrant colors and have excellent graphics. They are fun to play with and will be a great conversation and game starter. You will get more compliments on the appearance and quality of this set than any other you’ve owned! Great care is taken in the packaging and shipping of these exclusive billiard balls. The packaging is airtight, each ball is carefully wrapped, and they typically arrive a few days earlier than expected even with the custom design on the balls. Of course, when you order anything you expect the manufacturer to take pride in their shipping, but this package will definitely leave you impressed. Excellent shipping and manufacturing. The price of these is decent, about midrange, but absolutely worth it! They are of a high-quality phenolic resin with a custom, made-to-order design. Of course, you’ll be paying a little extra for the exclusive NFL logo and team design but you should know that going in. 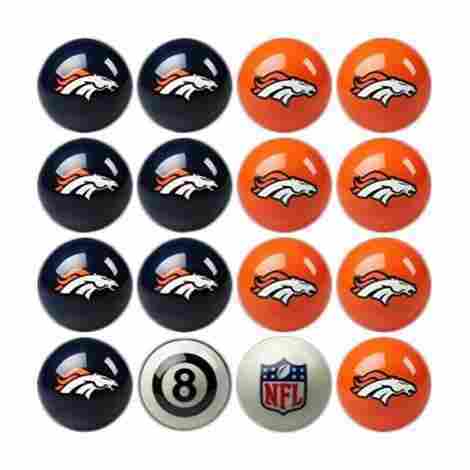 These are great conversation starters and will keep a crowd talking all through the game of pool and football! These are an excellent addition to any bumper pool ball table. They are good, solid balls that will withstand a lot of play. They are weighted well and roll nicely. They bounce perfectly and are easy to sink. Some of the “white” balls come in more of an off white color, so don’t be surprised by that. They are an affordable price and have quick delivery. They measure 2 ⅛”, so are not quite standard pool ball regulation size. They are made of cast polyester so will not work great on your regular pool table. When you find yourself a bumper pool table you will also need to be on the lookout for the right bumper pool ball set. Because of the bumpers set up across the game table, you will not be able to use the regulation size balls. These balls are slightly smaller and not quite as hard as a standard ball in order to allow them to bump around and slide through the bumpers into the pockets. These balls are polished and shined to a brilliant light. You will not be disappointed in the luster of these bumper pool balls. The marked balls in this set stand out nicely so you have no confusion as to which ball needs to be sunk first. The cost of these bumper pool balls is considerably less than most of the other regulation size balls on this list. They are a little smaller, there are ten balls in the set as opposed to sixteen, and they are just two colors which is less expensive to produce than the myriad of colors in stripes and solids. These will be a great accent to your bumper pool table. As we have discussed throughout this review, the type of billiard ball you want to purchase will depend largely on the amount of time you play and your skill level. Ultimately, you will spend more when you buy a phenolic resin ball, but they are stronger and will last longer than a similar set made of poly resin will. That may or may not matter based on how much you play. You want to get a set that will not wear out your pool table cloth and you want the balls to be high quality and have a high gloss finish. Even more importantly, you want the weight of the ball to be evenly distributed for a nice, smooth, and consistent hit every time. There are many different options of billiard balls, all made from similar products using similar techniques. You will want to do your research and consider how much time you plan to spend at your pool table before making a purchase. All the balls in this review will help you attain your ultimate goal and will withstand a lot of play. If you are more practiced and have a pretty solid break you may want to start out with the pricier, but more durable, balls. If you’re just getting started, the more inexpensive balls will serve their purpose very well. If you want a high-quality pool ball that will last you for a very long time despite heavy use, you want a one made of phenolic resin. Phenol is a mildly acidic organic compound that requires special handling during manufacturing. The process and molding of these into balls produces ones that last five times longer than others on the market made of polyester or polymers. When tested by a simulator, phenolic balls stand up to the test and are still good to use after being hit 400,000 times. After that many hits, most others are not even usable. If you don’t have the money needed to shell out for a phenolic resin set, there are absolutely other worthy options, though they likely won’t last as long. This isn’t a huge deal if you are a casual player and don’t put your billiard balls through heavy use and abuse. Polyester, plastic, acrylic, and other resins can also make a solid pool ball. They don’t have the balance or life of a ball made of phenol, but there are many options that will allow you to maintain a good shape and longevity with thousands of hits, just not 400,000. Ultimately, you will need to weigh how much you play with what material you need to get. If you are a casual player, you will do just fine with polyester, acrylic, or plastic. If you are more of a regular you’ll want a higher quality ball or you will just be replacing cheaper sets more often which ends up costing more in the long run. Your pool balls need to be treated gently. You don’t want them to lose their shine or get scratched. Polyester or poly resin balls are more susceptible to this due to the nature of the material. You’ll want to make sure you clean them with care and never use anything abrasive. Warm water and dish soap should do the job adequately. Make sure that you allow them to dry completely before trying to use them. Phenolic resin is a cleaned a little bit differently. To start off with, they typically don’t get as dirty so don’t need to be cleaned as often. You will want to avoid using any form of liquid soap here though; as it will form a film around the ball which will seriously mess with your game. If warm water alone won’t do the trick, you will need to invest in a cleaner specifically for this type of ball. Q: Will these balls yellow over time? A: Not for many years in normal use. Phenolic balls are less likely to yellow or show signs of wear. Q: Can you get a replacement ball without having to buy the whole set? A: Individual balls are available to purchase, although availability is sometimes limited. Q: Do the numbers on these balls appear fuzzy? A: Occasionally the numbers do appear fuzzy because of the clear coat over the outside of the balls. Q: Will the billiard balls leave a burn mark on my table felt? A: Depending on the type of the resin used to make the ball, they may leave a burn mark. Polyresin balls will be more likely to cause a burn than phenolic balls. If you are an experienced player who spends a lot of time playing and/or practicing, you would likely want to spend a little more money on a higher quality phenolic resin set. Q: Will the cue ball resist damage from a phenolic tip cue? A: You will want to match the resin of your tip with your cue ball for best results. Q: Is the cue ball white or slightly yellow/cream color? 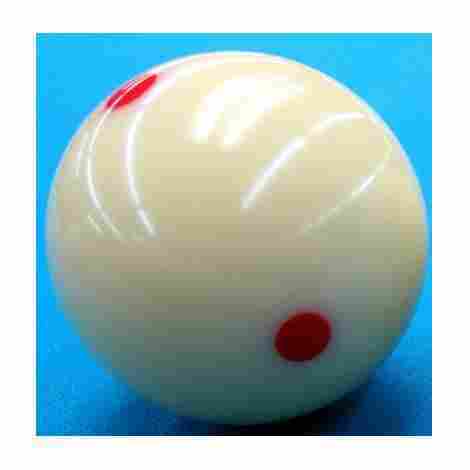 A: The cue ball will typically start off as a very light, bright white or off-white color and yellow with age. All-American Recreation, What Should I Look For When I Buy Billiard Balls?